When the heat is ramped up there's only one thing to do, go tropical, right? Sometimes the heat can go to my head a little as I become filled with a strong urge to rush out and purchase numerous species of palms and other exotic plants for the garden, only to remind myself that I don't actually live in a tropical climate here in Somerset and it's likely to rain sometime in the very near future! However, one of the things I love about interior design and styling is the magic, the power of illusion which allows us to dress up a room whether it's indoors or out and suddenly find ourselves transported into another world...no matter how far it may seem removed from our actual surroundings. Today's 'totally tropical' style is all about luscious greenery peppered with vibrant and exciting flashes of colour, it's also about celebration with a strong sense of partying and entertaining. What the heck, yes there should be a palm or two in this scheme too, afterall there are many hardy species suitable for the UK climate. Alternatively there are a number of hot palm prints currently available, including Sanderson's 'Manilla' wallpaper in the image directly 'above', which is guaranteed to make a graphic statement. 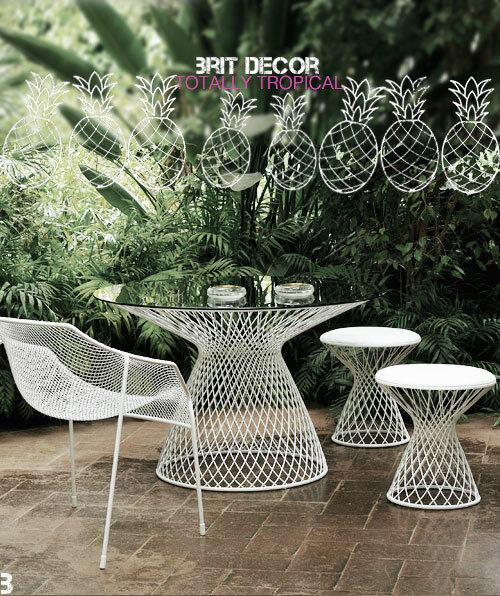 The most important element to consider when creating your very own totally tropical paradise? Fun - in abundance! 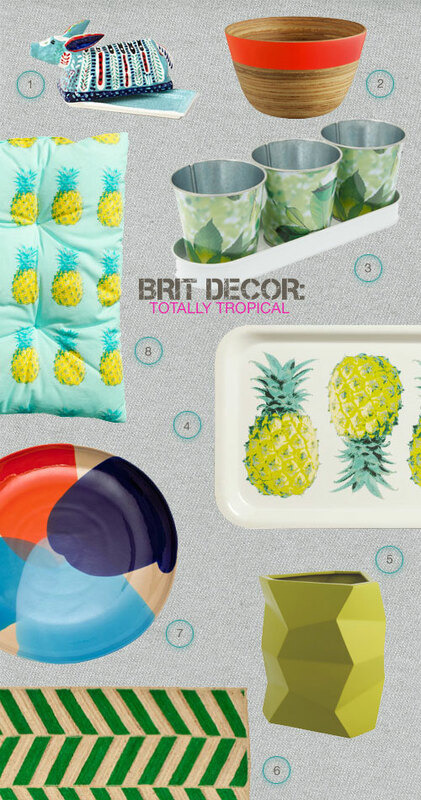 Below is a selection of accessories fit for our tropical setting. I absolutely love the handmade look of Anthropologie's 'Grasslands' butter dish (no.1) with its freehand patterns. Then there's the graphic leafy 'Green Elm' prints adorning these cute little planters from Liberty. 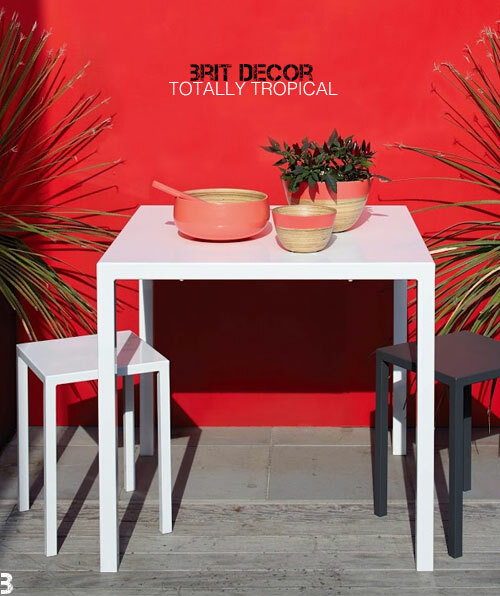 For sheer vibrancy, why not throw a colour bomb at your tropical scheme? The abundance of greenery means the palette can well afford some bold colour additions like the hot detailing of Habitat's 'Bam' bamboo bowl and this incredible 'Splash' print platter from Liberty. 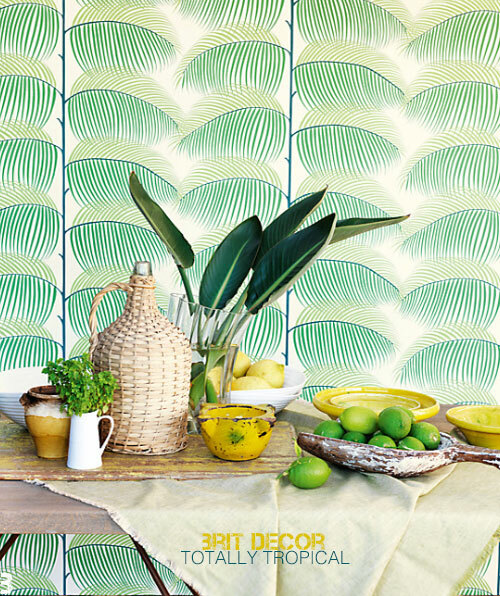 Whatever you are doing this week, I hope it's as exciting and uplifting as the totally tropical style!